Looking for a delicious vegetarian dish to serve as the entree at your next special meal? Wait, scratch that. Forget I said “vegetarian” because I should have just said “delicious.” It doesn’t even matter that it’s meat-free, because it’s so good that all you carnivores will love it too. I made this on Christmas to accompany my sister’s beautiful holiday meal and it was so good that I can’t wait to make it again. It was inspired by a dish I had a few weeks back at James Beard Award Winning Chef Jonathan Sawyer’s Greenhouse Tavern in downtown Cleveland. We went there for a special dinner before we watched the girls dance in the Nutcracker. I ordered the Acorn Squash Confit. I’m used to eating sub-par vegetarian meals when I go out; usually pasta with a bunch of bland sautéed vegetables on top. Sawyer’s Squash blew my mind. It was such a treat to be served a vegetarian dish that was not an after thought. Even my husband, who is not a vegetarian ordered it and he was raving just as much if not more than I was. So, when I told my sister I would make an entree to add to the Christmas table, Acorn Squash was the first thing that came to my mind. Of course, I couldn’t match the genius of The Greenhouse Tavern’s masterpiece, but I’d put my own spin on it. Here’s what I came up with. Preheat the oven to 450 degrees. Begin by washing the squash. Then slice them in half lengthwise and clean out the seeds using a spoon. Place all the squash flesh side up in one or two baking dishes. Next, melt half of the butter (4 tbsp.) and combine with the maple syrup. Stir and brush it over top of the flesh of the squash. Sprinkle with sea salt and pepper. Place in the oven to roast for 45 to 60 minutes until the flesh begins to brown and is fork tender. Set aside. Divide stuffing evenly among all the squash. 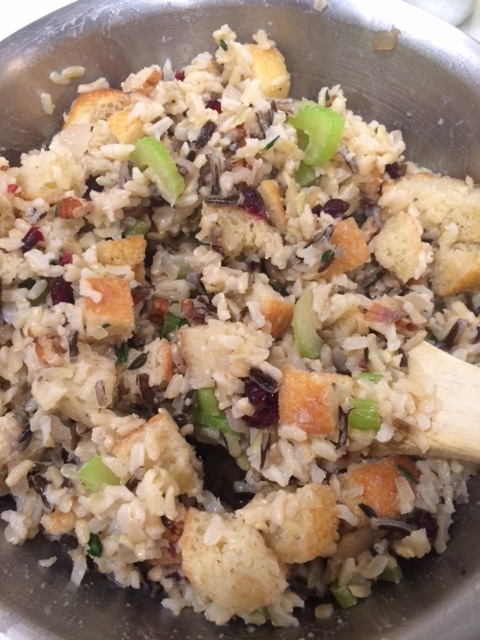 If you have some left over put it in a small casserole dish to toast in the oven and to serve on the side. 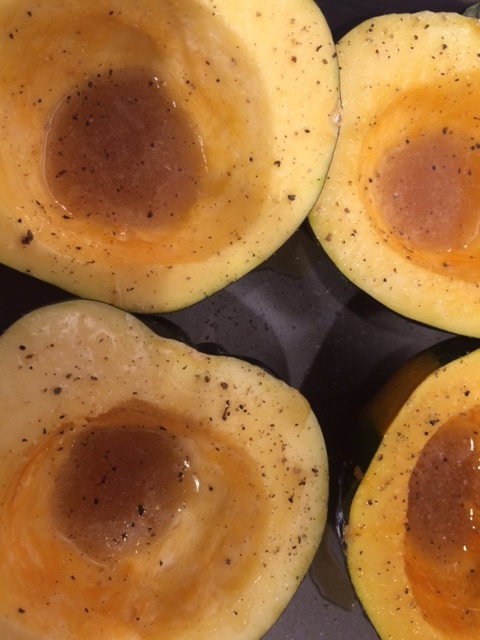 Place all the stuffed squash back in the oven for 20 to 30 minutes until the top is lightly browned. Serve warm. And remember, it’s ok to eat the skin of the squash. It’s full of vitamins and minerals and it tastes really good too. I hope you’ll enjoy this dish as much as we did. It is “fancy” enough to be the star of the plate at a dinner party or holiday meal or perfect as a side dish too. Lately as I’ve been focusing more on some of my career goals, I’ve let some other things slide a little. After accomplishing some pretty big athletic endeavors this year, like running three marathons (my first three ever), I was ready to look within myself and use the courage I had gained in new ways, perhaps some less self-centered ones. I couldn’t be more excited about where these endeavors are leading me and I can hardly wait to see my plan to help the struggling families of the Cleveland food desert come to fruition. They deserve better access to fresh, healthy fruits and vegetables and we are in a position to help. But that’s not what this post is about. This is about the other hobbies, passions and responsibilities I’ve begin to let falter. I haven’t been running 20-milers, in fact I’ve been lucky to even get in 3 or 4. My house almost always looks like someone just came through and ransacked the place. There is a basket of folded laundry sitting in my living room that has been there since last Wednesday. There is toothpaste caked on to the bathroom counter and the list of Christmas crafts and recipes on my Pinterest account has not gotten any action since last year. “You can’t get to everything.” “There are only so many hours in the day.” These are sayings I commonly ponder, but I honestly don’t know if I really take them to heart. But that’s not entirely my point either. As I was getting ready for bed the other night, feeling guilty about all of the things I didn’t get to, for some reason I also thought about periods of time when I DID seem to meet big goals I had set up in my mind. Like this summer, when my kids were away and I organized every inch of my house. Everything was in it’s place. Each toy was neatly tucked in the correct bin. Every piece of laundry had been washed and folded and carefully organized in each drawer. There were no crumbs under the kitchen table and no finger prints on the windows. I thought about a couple of years back when I had reached and surpassed my goal weight after striving to lose the extra pounds that lingered after giving birth to three children. After a lot of hard work I weighed 112 and wore a size zero. (I was too skinny… but I digress). Or how about when I ran my first marathon in Big Sur this past April? I trained through the bitter cold of winter. I ran the most beautiful course I probably ever will. I finished and celebrated meeting a goal that just a year earlier I would have never even attempted to accomplish. But guess what? During those times when I met every goal to “get organized” or to “get in the best shape of my life,” I still wanted more. It still wasn’t enough. I had achieved what was “the ultimate” in my mind in some areas of my life, but something was still missing. The closets were organized, but what about the messy garage? Why didn’t I get to that? I could fit into the jeans that I couldn’t get one leg in after I had John, but what about my arms? They needed more muscle definition. A day after finishing my first marathon, I was already setting a new time goal for my next one. 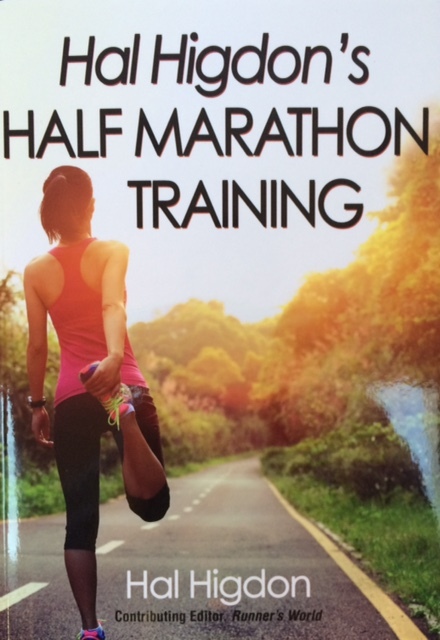 When I was at peak marathon fitness, I was in part wishing I was giving more effort to something more significant, like my career or helping others. I often subconsciously tell myself I can relax when it is all done. That I’ll be happier then. Am I obsessive? Sometimes. A perfectionist? Always. But I think it is just human nature that we always want more. In recent weeks I have come to discover this. No one can meet and stick with EVERY goal, ALL the time. There is no such thing as “perfection” in every area of your life all at once. We are jugglers. One ball is in the air, while another is falling. What goes up, must come down. It is a law of nature. You can’t train for a marathon and start a new business and run a household, and be as organized as Martha Stewart tells you to be and as crafty as Pinterest infers you should be. Not all at once. Despite what you’ve been told, you can’t “do it all.” Well, maybe you can, but somethings eventually gonna give. Your peace? Your happiness? Your sanity? I often think of the saying, “Jack of all trades, master of none.” We can’t do everything and do everything well. Lately I’ve been reminding myself to not feel guilty about the balls that are dropping. And if I focus on keeping fewer balls in the air it makes the remaining ones easier to juggle. Most of all, these days I’m striving to find happiness, contentment, and peace in this moment. Right now. Not when it’s all done. Not when I weigh less or can lift more. Not when my closets and my basement and my garage are organized, not when my kids are old enough to stop fighting, not when I finish the next marathon. Because if you’re like me, once you get to the end of one tunnel, you’ve already entered a new one. Don’t waste today, waiting for tomorrow. Each year we visit our friends at Howling Pines Farm to hunt for the perfect Christmas tree. It’s an event the kids ask us about for weeks in anticipation of what, to them, is the official arrival of “Christmas Time”. This past Sunday we made our annual trip. The short drive takes us out of suburbia just into the country. While it’s only 10 miles from our home, it feels like a short, relaxing vacation from our cares. It offers a step back from our holiday to-do lists to a little simpler life. Even if it’s only for an hour, it’s a welcome escape. I can’t remember a year when it has been quite so warm, but you won’t find any complaining here. After the brutally cold winters we’ve experienced here in Cleveland the past two years, this year I am NOT dreaming of a white Christmas. It’s a quiet, picturesque spot owned by a friend with whom my husband grew up. We attended their wedding and now our daughters will dance together as snowflakes in The Nutcracker next week. On this day, they were like little ballerinas dancing through the rows of trees. Ms Dakota always wants some love. After all, she is the farm’s namesake and the inspiration for the logo, so it would be awfully rude not to greet her. 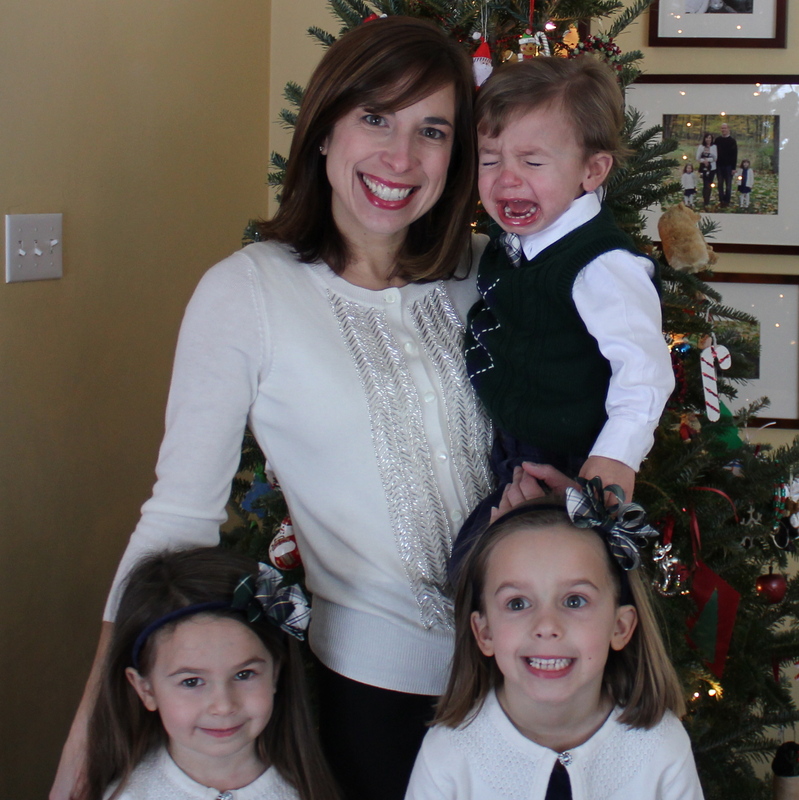 And of course, we always need to get a photo with the kids by the tree. Not OUR tree, but A tree. I think we had to bribe them with candy or something. I just couldn’t help but capture some other shots of this adorable place to look back on when I want to reminisce about our peaceful hour-long getaway. This “Christmas Time” I am striving to not get caught up in my holiday to-do list and lose sight of the reason for the season. In a blink, we’ll be taking down all the decorations we so carefully put up and we’ll be tossing out the paper from the packages we so lovingly wrapped. I don’t want to sigh with relief when the holidays are over. This year I am living in the moment and clinging to those that make it special, like our annual trip to pick out our Christmas tree. I only get to live it once, so I’d better enjoy it instead of just trying to get through it. Before long, we’ll be saying, “remember when” and “the kids were so little” and I’ll wish I could relive these magical days.